The was the second of two shows in different states that the Beatles played on this date - earlier in the day they were in Cincinnati. All other USA concert tickets that featured photos used shots from either 1963 or 1964. This was the only ticket to use a 1965 photo. 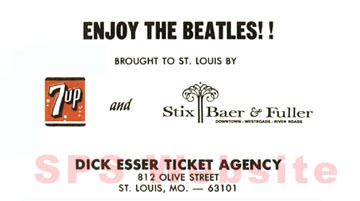 Promotional card from the St. Louis show. Click to enlarge. REPRO ALERT - The pink ticket shown above was reproduced a couple of years ago to be included as part of a framed photo "montage". Several concert photos were framed along with a copy of the playlist and 4 replica tickets. The tickets are almost identical to the originals, except that they have a disclaimer on the back stating that they are re-issues, and all have the same number "149 1 1" (which happens to be front row center seats). However, someone else has reproduced color copies of these tickets without the disclaimer on the back with an attempt to pass these off as real.